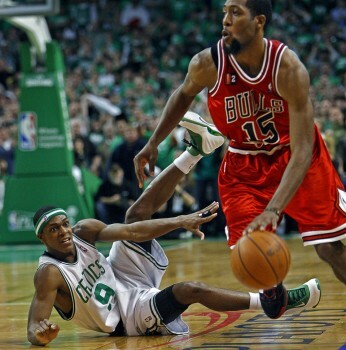 The Celts losing streak reaches two games as they fall to the Chicago Bulls 89-80. The Celtics season long problems came back to haunt them as they were out-rebounded by the Bulls 52-37 and gave up 16 offensive rebounds. They were held to just 12 fast break points as opposed to the 33 they put up against the Bulls just this past week. After being down 16 at one point in the early 3rd quarter, the Celtics fought and clawed their way back with a 22-7 run to take a 61-60 lead. The big surprise of the game was Mike James, who the Bulls just signed to a 10-day contract. He came off the bench in the 4th quarter as the Celtics were making their comeback and completely changed the game for the Bulls. He scored 8 points and had 4 assists in his 17 minutes and had the best +/- of any player on the court. His defense on Rondo was far superior to the play of John Lucas and will likely get minutes in the following games. Rondo had another effective night with his 18 points, 7 rebounds, and 8 assists, but he found the ball in his hand too late in the shot clock a few too many times and was forced to take shots that are not part of his game. A lot of credit is due to the Chicago defense. Kevin Garnett had an efficient double-double as he scored 18 points on 7-13 shooting with 10 rebounds. Ray Allen shot 3-8 from 3, all of them coming during the Celtics third quarter run. The Bulls were led by Deng and Boozer with 23 points each. Noah had 16 rebounds, 8 of them offensive; Kyle Korver missed all 5 of his 3’s; During their run, the Celtics went mostly to a 2-3 zone, something Doc doesn’t like to pull out very often, it was also the cause for their downfall as Mike James picked them apart in the 4th; Derrick Rose missed his fourth straight game with a bad back. Avery didn’t give us much to talk about last night, playing four minutes and missing his only shot. In a low scoring game against a team like the Bulls I would like to see some defense out there. Hurts to see Keyon Dooling out there for 9 minutes when Bradley’s losing the burn. This entry was posted in Celtics and tagged avery bradley, boston sports blog, Bulls, Carlos Boozer, celtics, Derrick Rose, Joakim Noah, kevin garnett, kg, Luol Deng, Mike James, noah, rajon rondo by leibo4. Bookmark the permalink.